CMP manufactures a premier selection of skimmers for in ground gunite pools. Our skimmers are available in a variety of colors, materials and kits to ensure the perfect skimmer for every pool. New pools are built in a huge range of colors and finishes, and pool decks are constructed out of many materials. A plain white skimmer doesn’t cut it. You could try a cover color, but that still leaves a white ring around the cover and the face and “throat” of the skimmer in white as well. It just doesn’t look seamless. Lots of thought goes into contracting a beautiful pool with attractive accents and accessories. A skimmer doesn’t have to stand out like a sore thumb. CMP skimmers come in a mix of colors. We even have two tone options that allow you to match the inside of the pool and the deck at the same time! 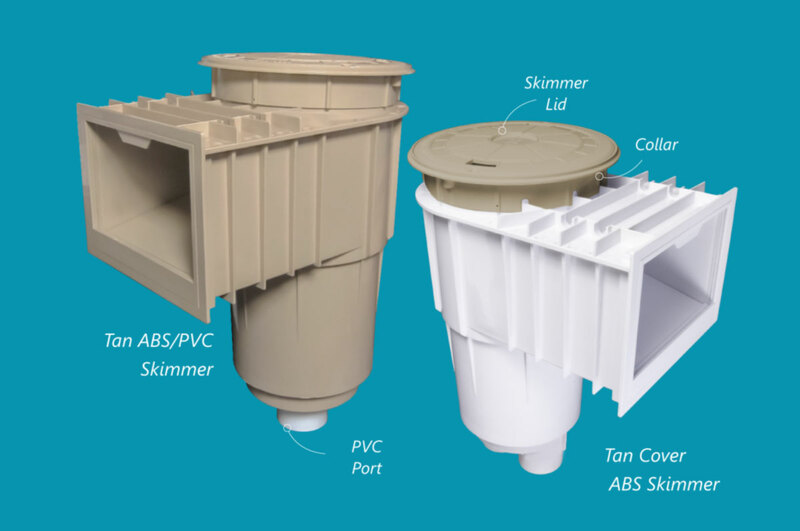 CMP skimmers are available in all common pool and deck finish colors to complement or match the pool environment. Many pool builders create custom pool covers for a skimmer lid that disappears. You can also use CMP Natural Wonders Covers for an attractive and durable skimmer cover option. But that means you would throw away the original cover – no one likes waste! Now CMP offers skimmer kits with no cover for use on pools with a custom skimmer cover. 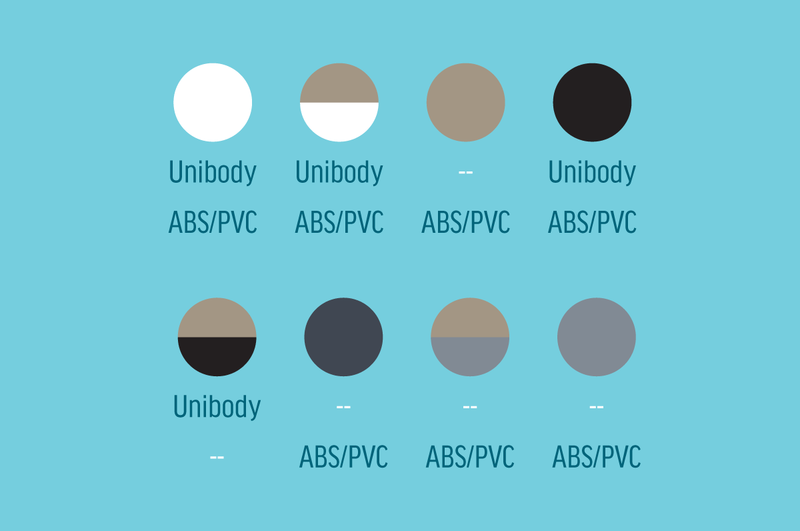 ABS UNIBODY OR ABS/PVC . . . WHAT IS RIGHT FOR MY POOL? CMP offers skimmers in two construction styles: the traditional ABS Unibody and ABS Skimmers with a PVC Port. Each has their advantages. Some builders like Unibody skimmers because of their solid construction and lack of any glue joints. ABS Skimmers will require ABS to PVC glue for installation which is an added step. If you would rather skip that step and use typical PVC glue, CMP has the ABS/PVC Skimmer. These high quality skimmers pass our QA process for leaks so you can get the same solid build as the Unibody style without using a special glue. We also offer our ABS/PVC skimmers in more color options. WHAT OTHER FEATURES CAN I ADD? CMP Skimmers can be ordered as kits with different accessories or features included. In addition to color, you can probably find the accessory and order the perfect skimmer for any pool. Float Valve . . . What’s That? Some skimmers include a float valve. You may have also heard them called “mushroom diverters.” These aren’t used in every region so you may not be familiar with when and how to use them. 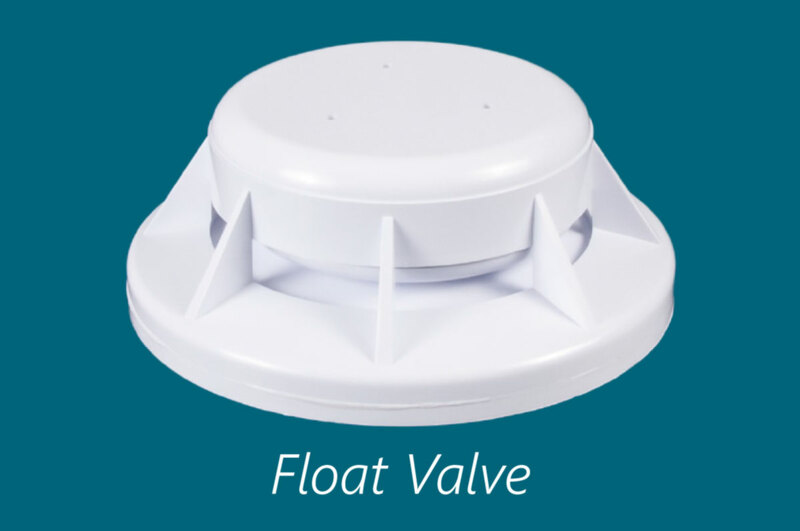 A float valve is a great way to keep the pool operating efficiently and protect equipment. A float valve is placed inside the skimmer below the basket. If the water level drops below the skimmer, the float valve gets “sucked” down and shuts off the port. 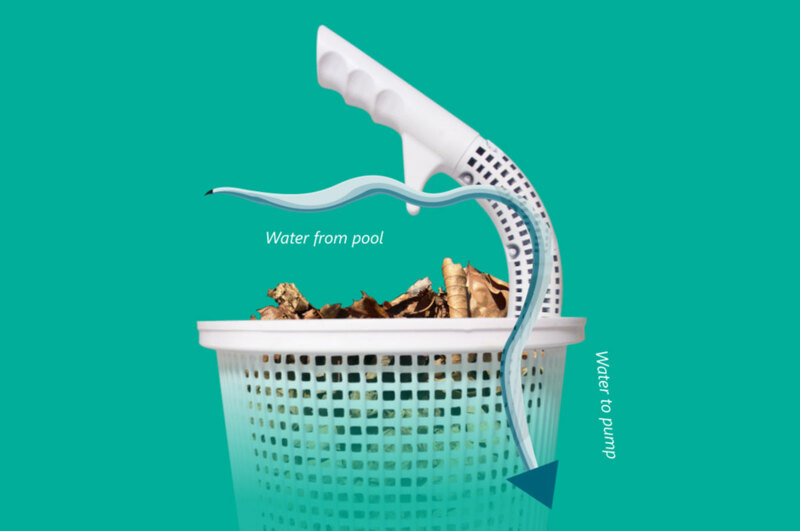 This prevents the pump from running dry and ensures the pool continues circulating with only the main drain. The Flowskim basket has a built in handle – it makes the basket easier to use and assist with pump flow. Use the handle to remove the basket without touching dirty, wet debris. The handle also provides a flow path even when the skimmer is full, protecting the pump from running dry. Other baskets are available with a built in post or handle. These are usually right in the center of the basket. Imagine using a coffee cup with the handle right in the center of the cup! Not exactly convenient. Our side handle orientation allows you to empty the basket while keeping your hands clear of the debris. Our improved design is protected by U.S. and International Patents. Since 2008 the National Electrical Code (NEC) has mandated that pool water must be electrically bonded, not just metals in the structure of the pool itself. Typically pool water is bonded at the light. With the advent and growing popularity of “nicheless” LED lights, a new solution is required. Every pool has a skimmer, so you can easily meet electrical code requirements by installing the Pool Defender® In Ground Skimmer with integrated water bond. Learn more about water bonding with the CMP Essential Guide to Water Bonding. With so many options available, it’s a lot to consider. Our skimmers are listed on the CMP website and in our catalog. But you might want a more convenient tool to narrow down the options. For you, we have created the Select-A-Skimmer tool. Use our simple online form to select the features you want in a skimmer like Color, Pool Defender, Lid Shape and more. Your selections will generate the right part number so you can place the correct order. We’ve got a lot of options, but some combinations may not be available. If there is an important option missing, contact us and let us know! You can also download the CMP Skimmer Guide Brochure. Click here to view or save the brochure. Still looking for more information. Complete the form below for more information or to contact your CMP Pool Products Representative.